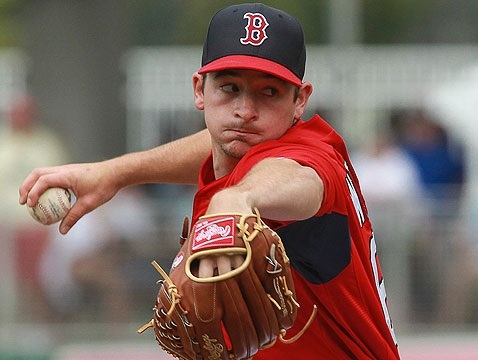 It’s easy to forget that Joel Hanrahan was a member of the Red Sox in 2013 after he appeared in only 9 games before becoming injured and then a free agent. Combined with the oft-and-still-injured Andrew Bailey, the Sox have at least two openings in the ‘pen in 2014. The closing gig is obviously Koji Uehara‘s to lose after posting a ridiculous 2013 including his unhittable playoff showing, and excellent seasons from Craig Breslow and Junichi Tazawa have likely solidified their places as the left and right-handed setup men behind him. The Red Sox currently appear poised to open 2014 with Felix Doubront, Ryan Dempster, and Franklin Morales (and ostensibly Allen Webster, Drake Britton and Rubby de la Rosa) all competing for the fifth starter gig, and therefore I’d expect that at least one or two of them are not with the club come Opening Day to make that situation a bit more tenable. Dempster, to me, seems most likely to be dealt since he’s being paid like a third starter and has been fairly ineffective in Boston. The Red Sox have Webster, Britton and de la Rosa all stashed away in the high minors and all stretched out as starters, though the setup of their roster for 2014 seems to indicate that at least two of them should be destined to help out in the ‘pen if they’re not starting in Patwtucket – or Boston due to injuries. All three have already made their debuts, with Britton’s going by far the best. Webster had a much better year in the minors than de la Rosa, his companion in the Dodgers-Sox blockbuster of 2012, though his debut went slightly worse. Britton, being a lefty, has the obvious edge of the three to crack the roster especially if Doubront is promoted to the rotation to start the year. He’s a left-hander who throws a curve and a change to complement his fastball which has nice low-mid 90s velocity, though struggles with his mechanics have caused him to battle inconsistency throughout his pro career. Webster is a hard throwing righty with an average fastball velocity of 94.4 along with a slider, curveball and change of varying effectiveness. In their 2013 top prospect rankings, Fangraphs included a note from Mike Newman that indicated concerns over Webster’s stamina and hinting at the possibility that he profiled increasingly as a shutdown reliever. Webster should see significant action in 2014, along with Britton, while in my opinion de la Rosa will continue to try and figure out how to throw strikes consistently in the upper minors. I would expect that Boston plans to make whatever roster moves they need to to accommodate such a reality, especially since that could mean ridding themselves of 13.5 million dollars worth of Ryan Dempster. Posted on November 20, 2013, in Bulls for the 'Pen, Promotions, Red Sox and tagged Allen Webster, Andrew Bailey, Craig Breslow, Drake Britton, Felix Doubront, Franklin Morales, Joel Hanrahan, Junichi Tazawa, Koji Uehara, Rubby de la Rosa, Ryan Dempster. Bookmark the permalink. Leave a comment.